The process of hard anodizing is broadly employed across numerous commercial industries. It is a highly effective surface treatment when industrial parts are exposed to high corrosion or aggressive wear environments where component integrity and dimensional stability are essential. Anodizing is a well-established metal impregnating process with primary application on two fronts; one that enhances the appearance of various metal components in a decorative sense and another that improves the wear characteristics and corrosion resistance of said parts to ensure top performance. The process is similar for both, differing primarily in the thickness of the coating, the process used to achieve it and, of course, the reason for applying it. Diamond’s hard anodizing process is vigorously controlled to ensure consistent depth and hardness. 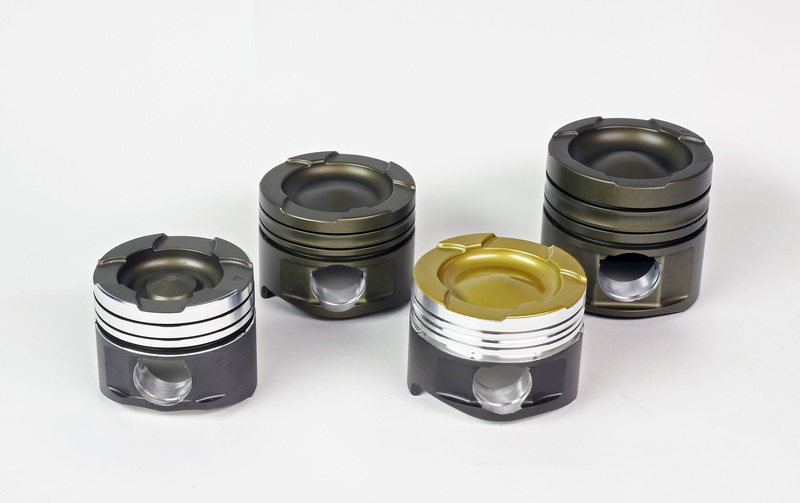 Hard anodizing is applied to high performance pistons to enhance component integrity in critical areas like the ring lands and the piston skirts. Type 3 anodizing, or hardcoating plays an important role in combating microwelding between the ring grooves and the piston rings. Microwelding is a form of localized component welding characterized by the separation and transference of piston material from the piston ring groove to the underside of the piston ring. It is a form of friction welding caused by high temperature and excessive movement in the ring groove. Ring seal at the cylinder wall is only as good as the seal at the bottom of the ring groove under combustion pressure. When temperatures are high, and the clearance is incorrect, microwelding can occur and proper sealing suffers. When microwelding happens, it restricts the free movement and rotation of the piston ring and can ultimately jam the ring in its groove, causing a rise in blowby and increasing the potential for detonation. Over time the ring groove can flair, increasing clearance and further destabilizing ring movement and function. Hard anodizing toughens ring grooves and resists the undesirable transfer of material to the bottom of the ring and its destabilizing effects. 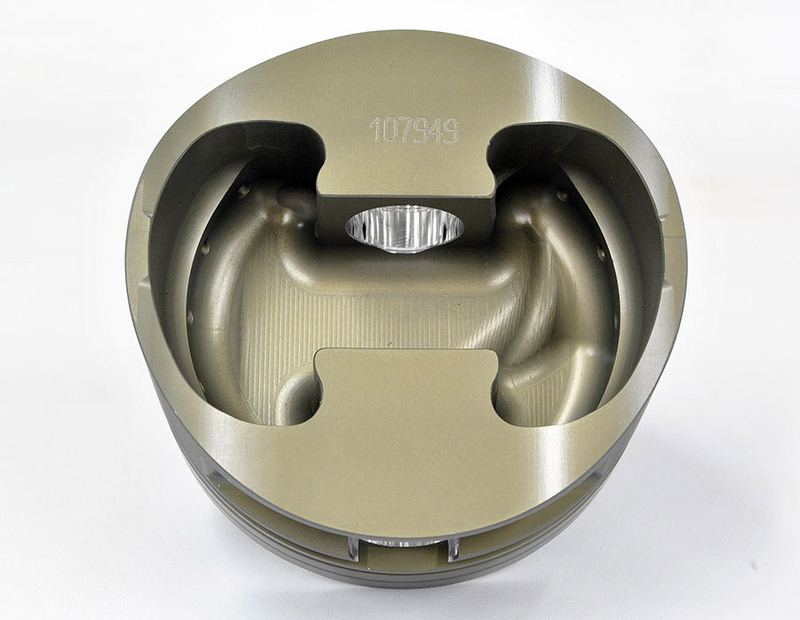 Diamond Pistons has pursued a robust program of providing high quality ring grooves in its pistons, both dimensionally and in terms of surface finish and resistance to the effects of microwelding. Hard anodizing is an additional step in that direction. Hard anodizing is particularly useful for ring groove protection. Hardened ring grooves afford optimum sealing characteristics and resist micro-welding between the ring and the ring land. Hard anodizing can be done on the entire piston as well as just the ring lands. 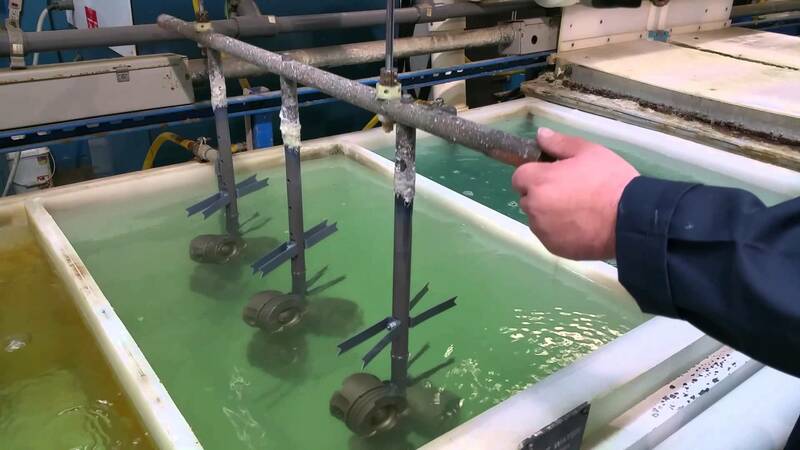 The anodizing process submerges a given metal part in an electrically conductive acid solution called an electrolyte. In the language of electrical circuits, we find a positive electrode (cathode) where electrons enter the circuit. They exit the circuit via the negative side (anode). In the anodizing process, the piston becomes the negative electrode. An electrical current passes through the solution, into the piston, and deposits a hard, corrosion resistant layer of oxidation on the piston as it exits. Hard anodizing typically uses a higher current and a weaker electrolyte solution at a lower temperature. 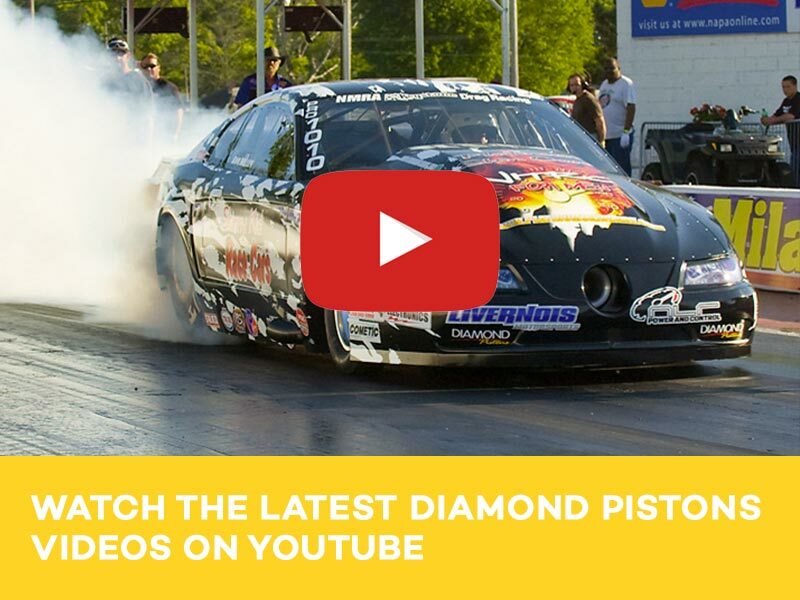 All of Diamond's forged aluminum diesel pistons are treated to hard anodizing to prepare them for the rigors of that high cylinder pressure, high-boost environment. One popular feature offered on performance pistons is top ring groove coating via hard anodizing. This method supports power increases by permitting tighter tight ring clearances. It creates a harder mating surface that is very resistant to micro-welding, thus decreasing ring groove wear and the likelihood of ring failure due to seizure. The typical buildup is .00025" and additional clearance is accommodated during manufacturing. Because anodizing is exceptionally hard, it can add a measure of roughness to the surface. So additional anti-friction/anti-scuff skirt coatings are often applied over it to help control cylinder bore wear. Diamond combines hard-coat anodizing with a baked-on molybdenum dry-film lubricant skirt coating that provides an anti-friction anti-scuffing surface. The build-up from the anodizing process requires extra machining clearance of about .002-inch on the piston diameter and the width and depth of the ring grooves (before anodizing occurs). The pistons are then submerged in a detergent-acid bath, followed by multiple rinses before anodizing and three rinses afterward. 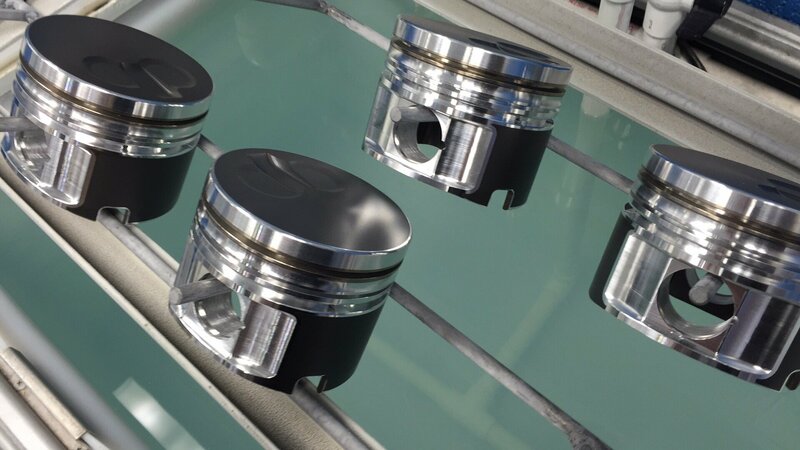 After anodizing, the pistons move to the coating room where they receive five light coats of the moly dry-film lubricant and are then oven baked for an hour. Diamond’s double-coat procedures are all performed in-house and its single coatings, either anodizing or moly-skirt, are still available. Some engine builders prefer naked pistons with no anodizing. This is primarily in endurance applications that run at wide-open throttle for extended periods of time. 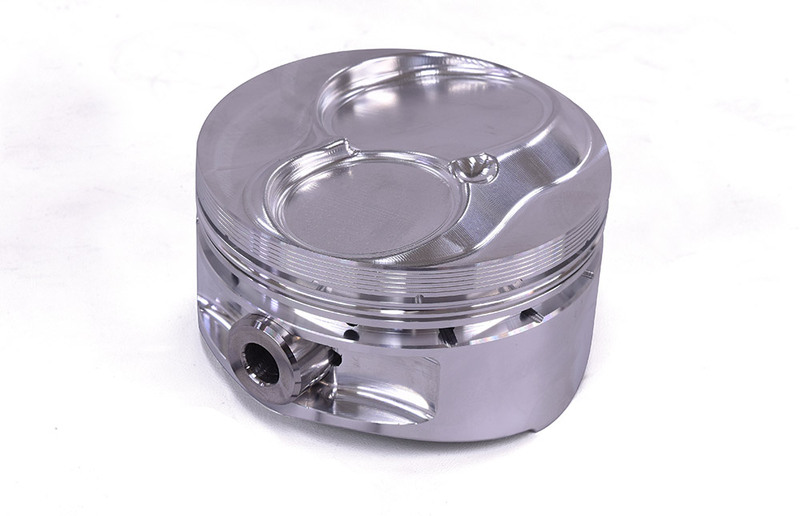 In certain conditions, anodizing can inhibit heat transfer between the piston and cylinder wall. Hard anodizing also affects heat transfer. While it is broadly understood that heat transfers to the cylinder walls and thus the cooling system via the ring interface, heat also transfers through the skirts. There are differing schools of thought primarily addressing final application. On one hand, it is desirable to retain heat in the combustion chamber to support greater power and efficiency. That’s particularly true in shorter duration drag racing applications. It can also be true for longer duration applications such as sprint cars, cup cars, and normally aspirated road racing applications provided that the engine builder is comfortable with the necessary increase in piston to wall clearance. In addition to hard anodizing, the pistons are also treated to an anti-friction coating to make them less abrasive on the cylinder walls. In supercharged and turbocharged applications, more heat transfer from the piston is necessary. Some builders favor the tighter clearances and reduced piston rock of non-anodized pistons. One highly successful builder has stepped back from anodizing for his very high horsepower, long duration Bonneville engines precisely for that reason, although he is quick to acknowledge its advantages in other applications. So, more often than not, hard anodizing remains a performance enhancing feature except in some occasions where very high cylinder pressure and associated heat is created over a long duration such as a 5-mile run at Bonneville with 3,000 horsepower and 3 bar or greater boost. What’s right for your engine? Like almost everything else, it is application specific. The best choice of action is to call the Diamond Pistons tech line and get expert consultation, not only about your piston requirements, but also recommendations on the best coasting solution for your application.